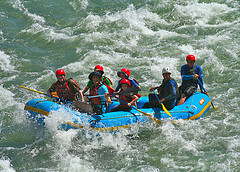 For experienced paddlers, there are challenging, adrenalin-pumping sections of class four rapids, as seen in sections like Pascua on the Reventazon river. Thrill-seekers can enjoy big volume runs through class three rapids while those looking for something calm and leisurely, there are beautiful, easy trips suitable for the whole family. You can devote a few hours to the activity or a few days. The multi-day trips are an incredible way to experience Costa Rica as they pass through untouched natural scenery, spending your nights in various wilderness camps and lodges. Costa Rica has a good safety record with white water rafting and there are a number of reputable companies offering white water activities in the country. One of the most established whitewater rafting companies is Rios Tropicales, who offer a large variety of trips on the Pacuare, Reventazon and Sarapiqui rivers among others. The Rio Toro River is another popular white water challenge in Costa Rica but its class three to four rapids are not for the faint of heart.